AKC in the last 60 years has come a long way. He is credited with having established clarinet as a pleasing wind instrument in which he has carved a niche for himself the world over. 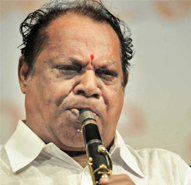 The late Pillai instantly conferred on him the title ‘Clarinet Everest’. At 78, AKC has a saintly demeanour and the enigmatic personality when he was young. His performances have enlivened many souls in the nook and corner of the world. Even at this ripe age, he is full of enthusiasm. AKC comes from a family that has been devoted to wind instruments. His grandfather Kuppuswami Naidu was a nagaswaram artiste who later took to clarinet. AKC learnt Carnatic music from Alathur Sri Venkateswara Iyer, and later the basics of nagaswaram from Ellupur Sri Natesa Pillai. But it was the influence of his father, A. K. Chinnakrishna Naidu, who was playing clarinet himself, which made the young Natarajan have a go at clarinet, then an accompanying instrument for satir and Devaram rendition. He underwent all the hardships to learn to play the instrument in the hard way. Hours of sadhana brought not only mastery but also blood trickling from the ripped lips. AKC’s maiden concert took place in 1946 and since then he has not looked back. Even in the initial years itself he got a wide range of opportunities to perform in the presence of the doyens including Ariyakudi Ramanuja Aiyengar, T. N. Rajarathinam Pillai and Palakkad Mani Iyer and this enabled him to gain much confidence. He worked hard for the clarinet to be accepted as a Carnatic instrument by the layman and the connoisseur. He brought his profound vidwat and musical abilities to play and succeeded in bringing the vocal and nagaswaram banis to the instrument. His raga alapanas, his swara renditions and above all his special way of presenting kritis are unique. He was honoured with the title ‘Isai Perarignar’ by the Tamil Isai Sangam and the Music Academy, Chennai, presented him ‘Sangita Kalanidhi’ title recently. His lifetime achievements and methodology was the subject of a research conducted by Prof. Williams of the Disney University.